Every year we raise 100-150 laying hens, 300-500 broiler chickens, and occasionally Turkeys and Guineas. All of our birds start out as day old chicks shipped to us through the US postal system! When they arrive at the farm, they are vulnerable and need some TLC. So we keep them in a deeply bedded and heated room in the barn - the brooder room. We feed them soil from the compost pile and a blend of certified organic grains. After a few weeks they are ready to go out on pasture! Chickens are rotated daily onto fresh grass, giving the soil time to utilize the valuable manure that the birds leave behind, as well as allowing the pasture plenty of time to rest and regrow. When the chickens have moved on, we follow behind them with our cattle and sheep, grazing the exact same pasture. It’s a circle of fertility, renewal, and sustainability. Does true free ranging really make that much of a difference? In a word, a resounding YES! Access to nutritious clover, fresh grasses, seeds and bugs, creates an obvious distinction in the taste and texture of the meat, and also makes a huge difference to the environment, and the sustainability of our farm. We butcher broiler chicken five times throughout the season. If you want fresh pasture raised chicken please stop by or drop us a line! We only set aside a few for sale as fresh, the rest get super cooled in our freezers and are for sale throughout the rest of the year. We raise a mix of heritage breeds to be part of our laying flock each year. It takes us 6 months to raise an organic pastured laying hen, day old chicks must grow into 6-month old pullets before they begin laying. 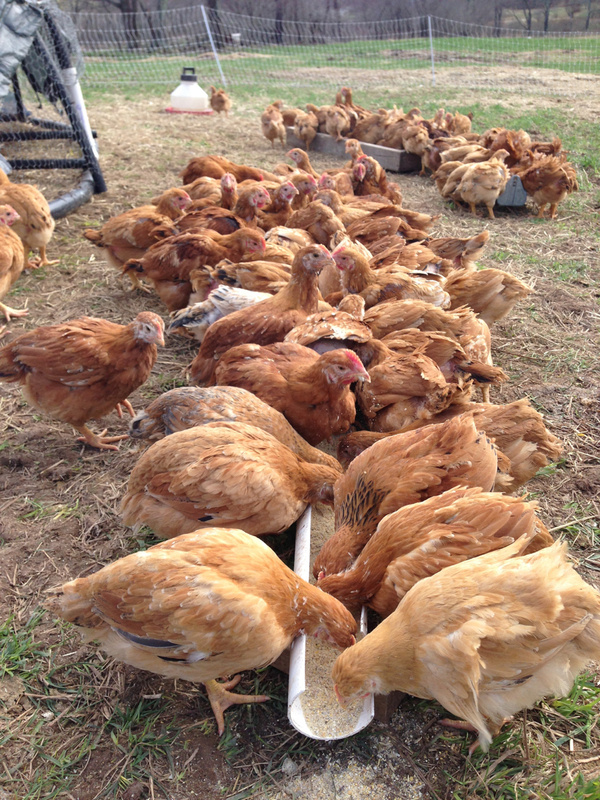 Outside on pasture our hens love to peck and hunt for bugs, worms, and micro-organisms in the soil. The bright orange color of the egg yolk will tell you if the mother has a diet rich in grasses and bugs. If the yolk of the eggs you eat is pale yellow - the hens are not enjoying the same rich diet. In the spring, summer and fall, our hens live out in the pasture in mobile coops. Every day the coops are moved a few feet to distribute the droppings from the hens which fall through the mesh floor and fertilize the pasture. In the winter when grass is scarce we feed our extra winter squash and hay.